Pot covers: choose 7cm pot covers to give a good fit over the pots. 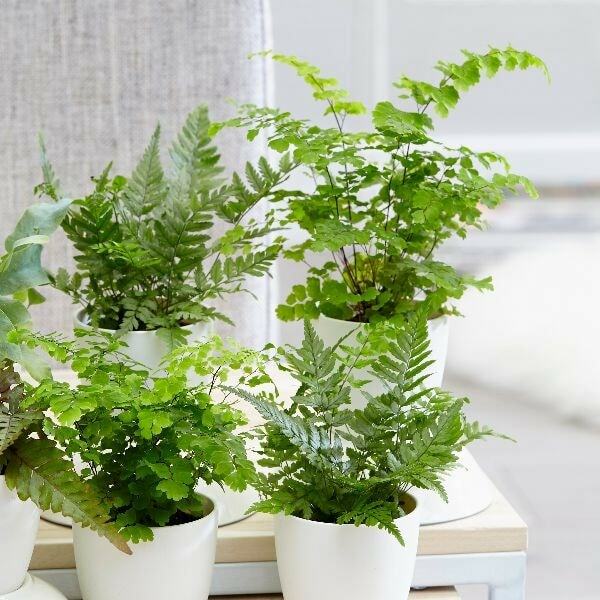 These young ferns are perfect for setting up a terrarium or bottle garden - or you could pot them up individually and line them up along the windowsill. 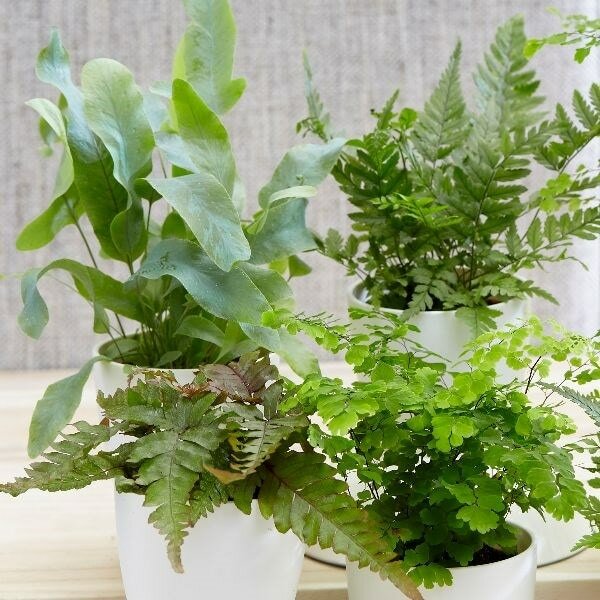 All of the ferns are un-named and un-labelled, so its a bit of a lucky dip as to what you will receive, however if you order the 6-pack collection (6 × 6cm pots), we will send you as many different ones as possible, making sure that you wont receive any more than two of the same type. Please note that the pots in the photograph are not supplied with the plants (which are sent out in plain plastic pots). They do however make excellent potted plants, and if you wish to pot yours up, we do have a wide range of pots on our website to choose from. Home care: Water regularly in the growing season - less in winter and in areas of low humidity, mist the leaves with water on a regular basis, or place the pot on pebbles in a tray filled with water. Maintain temperatures above 10°C in winter and avoid summer temperatures above 25°C. Repot in spring when the plant becomes root-bound. 6 healthy good looking plants. 2 each of 3 types. Really well packaged for transporting. Terracotta coloured pots, not black as described, but that's not a problem, as they need containers anyway. I'm pleased with these teeny single plants, I hope to keep them thriving. 4 stars is because only 3 types, would have like more choice. I bought the 6 fern starter pack and was pleased with how healthy and nice they all looked. However I got doubles of all three ferns, resulting in only 3 different types overall. I was hoping there would be a bit more variety. Overall I am pleased with the packaging, delivery and product.